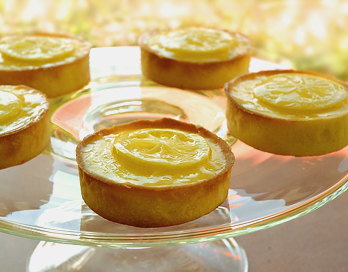 Remember I published a request on my blog for eggless lemon curd and eggless custard tarts? Here’s a recipe for Lemon Curd from Maharani Dasi. Thank you!! optional 1 tablespoon cornstarch dissolved in a little cold water. In a heavy saucepan bring to a boil the lemon juice, zest, and butter. Whisk in the confectioner’s sugar, and reduce to a simmer, whisking and watching for it to thicken. If it doesn’t seem to be reaching the desired consistency, this is when you add the cornstarch in water. With a little more cooking, it should thicken up. If not, add a few more spoons of confectioner’s sugar. It will thicken more on standing, so don’t add any more cornstarch than absolutely necessary, because otherwise it will taste starchy. Give it a try, readers, and let me know how it worked out.